At first glance Locust Jones’s large-scale ink on paper works appear to be non-figurative expressive gestures of ink, however as one surveys the surface the splatters become recognisable and detailed. Out of the criss-crossing ink emerge crumbling buildings set in ravaged landscapes; soldiers, rabid dogs and piles of skulls collide with skeletal aeroplanes and sinking oil wells. 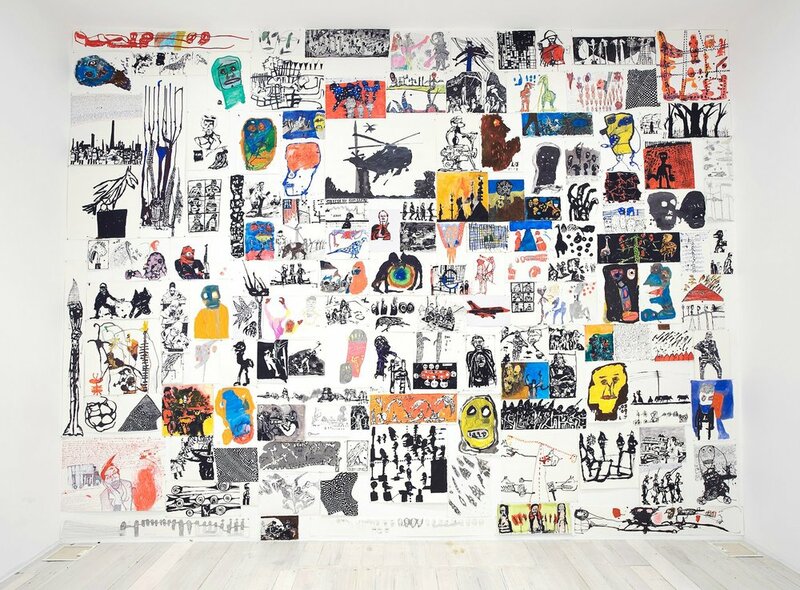 Gleaned from newspapers, magazines and Internet news sites the images portrayed collide and merge forming a cacophony of political ranting and world news chatter flittered by Jones personal interpretations and political concerns. The works are poignant and reflective; they are a personal attempt to make tangible the chaos of world events and the bombardment images we are exposed to, a context, within history and the personal psyche. Locust Jones was the 2009 recipient of the Hazelhurst Art on Paper Prize and recently included in I Walk The Line: New Australian Drawing exhibition at the MCA. Other prizes and awards include; selected for the Fremantle print prize 2009, 2007, 2006, The Blake prize 2009 (also selected for The Blake travelling exhibition), the Geelong print prize 2009 and the prestigious Kedumda drawing award 2008. Working and exhibiting extensively in Australia and overseas, Jones residences include the Lower Eastside print workshop in New York, Espace studios in Beirut and Sakshi Gallery, Mumbai, India. Jones’s work can be found in numerous private and public collection including Art Bank Sydney, the University of Wollongong, the Ministry of Foreign Affairs and Trade New Zealand, the Centre of Contemporary Arts, Christchurch and the James Wallace Collection in Auckland, New Zealand.